Once you pull the S Pen out, the Air Command menu pops up. The menu is available throughout the UI. It's a virtual ring with five shortcuts - Action Memo, Scrap Booker, Screen Write, S Finder and Pen Window. If you prefer, you can set Action Memo to pop up instead or just nothing. The Action Memo lets you write stuff and then use it to initiate an action - i.e. add a contact name and number to your phonebook, or check out an address on Google Maps. You just need to mark a part of the text and send it to one of the supporting apps. The handwriting recognition is impressively fast and accurate - it handles just about everything you throw at it. The S Finder is a local search that'll browse through all the content on your Note Pro 12.2 with preset filters. It can search in all S Pen content you've added (including notes, scrapbook pages, etc. ), messages, multimedia, settings, phonebook, even the internet. Naturally, all handwritten stuff is an easy job for the S Finder. You can even search for symbols you've drawn with the S Pen. That last one seems to work quite slowly however, and unless you actually use the scrapbook quite a lot you probably won't need it that often. The last element of the Air Command menu is Pen Window, which we covered in the previous section. The S Pen also supports Air View - when you're hovering the S Pen over text or an image, the software responds and brings a larger popup version of it. Smart Scroll is yet another feature that leverages on the front-facing camera - it allows you to scroll up and down by tilting the tablet or by tilting your head. It's a bit hard to get used to, but once you do it' can be useful in certain scenarios. Another Samsung-exclusive feature is dubbed Smart Pause. While watching a video, it uses the front-facing camera to track your face and will automatically pause the video when you look away. Look back at the screen and the playback continues. There is a basic set of motion gestures as well - you can zoom, move stuff or browse images by tilting or panning the device. You can also pause the music player by putting your palm on the screen. A palm swipe takes a screenshot. 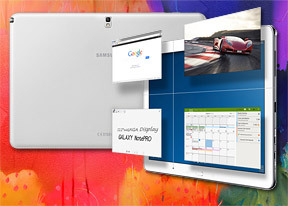 The Galaxy Note Pro 12.2 tablet features both Google Now and Samsung's S Voice. It provides traffic information to your work or home, knows the scores of sports teams you follow and gives you the weather forecast for your location. Google Now also has its own dedicated homescreen widget. S Voice does duplicate parts of Google Now, but being less search-focused it tries to do more on the actual tablet and it has some added features. Some of these are available outside of S Voice too, so you can set the Galaxy Note Pro 12.2 to snooze an alarm, take a photo and what not by voice commands even when S Voice isn't running. The only problem with S Voice is it's not nearly as fast or as accurate at recognizing your speech input as Google Now.